I just have to VENT! Have you ever felt like this? Who hasn't?! Especially in divorce. The process (and perhaps your soon-to-be-ex) can be exasperating, frustrating, and even infuriating. Which is totally normal and definitely gives rise to the need to be human and vent. But is your attorney the right one to vent to? Sometimes, yes and sometimes, no. Rebecca Zung, Esq. and Susan Guthrie, Esq. pull back the curtain on what your attorney is actually thinking and what to do and not to do in your divorce attorney relationships. What should you be asking your attorney or telling your attorney? How often should you be speaking to them? The divorce process is a confusing haze that can be overwhelming. This episode will give you all the tools you need so that the next time you feel the need to vent, you will know exactly what to do. Listeners have been asking for more information on how to deal with their High Conflict Ex so we have gone to the best of the best to bring you this very special expanded format two-part episode with BILL EDDY, the leading expert on the subject. Bill is a therapist, attorney, mediator and the co-founder, with MEGAN HUNTER (see episode #104) of the HIGH CONFLICT INSTITUTE. Bill is also a prolific author and has written the High Conflict Divorce books that Rebecca and Susan mention in so many episodes including BIFF, Splitting and It's All Your Fault! In this second episode, Bill continues to discuss the principles in these books as well as the advice he gives in his most recent book, The Five Types of People Who Can Ruin Your Life. These episodes will give you REAL, ACTIONABLE ADVICE on how to manage the Narcissist, BPD or other High Conflict Ex in your life, so listen to these episodes and learn how to BIFF, EAR, WEB and CARS today! For more information on BILL EDDY please visit www.highconflictinstitute.com. His books can be purchased on AMAZON or by visiting UNHOOKED BOOKS. B.Y.E. DIVORCE RETREATS - as recently announced, REBECCA, SUSAN AND GABRIELLE HARTLEY (Author of Better Apart: The Radically Positive Way to Separate) are partnering to bring you the B.est Y.ou E.ver Divorce Retreats, which will feature inspirational and practical help for women going through divorce as well as those who are still recovering from the process! Many of our podcast guests, including ARIELLE LORRE, JENNIFER GIAMO, TAMMI LEADER FULLER, ERIN LEVINE and LILI VASILEFF will be featured at the retreats. Celebrity Attorney, LAURA WASSER will also be our special guest during a LIVE taping of our podcast! The first retreat will be held in Los Angeles on MAY 18, 2019! You can find more information and register to attend or sponsor the events at www.BYEDivorce.com. SEATS ARE LIMITED SO DON'T DELAY! Rebecca and Susan are so pleased to be partnering with the premier co-parenting app Fayr who has sponsored this episode. Fayr provides co-parents with the tools to help them to communicate more easily and to reduce conflict so that they can seamlessly continue to parent their children. You can find out more about Fayr at www.befayr.com. 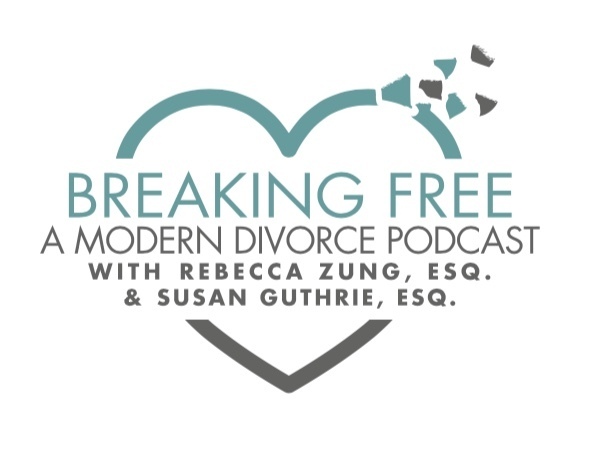 Listeners of Breaking Free: A Modern Divorce Podcast receive a 20% discount on their subscription with code "SusanG18"! Hello Divorce is a resource for forms and documents and legal assistance in California recommended by Breaking Free: A Modern Divorce Podcast. Go here for more!" Listeners have been asking for more information on how to deal with their High Conflict Ex so we have gone to the best of the best to bring you this very special expanded format two-part episode with BILL EDDY, the leading expert on the subject. Bill is a therapist, attorney, mediator and the co-founder, with MEGAN HUNTER (see episode #104) of the HIGH CONFLICT INSTITUTE. Bill is also a prolific author and has written the High Conflict Divorce books that Rebecca and Susan mention in so many episodes including BIFF, Splitting and It's All Your Fault! In these two episodes, Bill discusses the principles in these books as well as the advice he gives in his most recent book, The Five Types of People Who Can Ruin Your Life. These episodes will give you REAL, ACTIONABLE ADVICE on how to manage the Narcissist, BPD or other High Conflict Ex in your life, so listen to these episodes and learn how to BIFF, EAR, WEB and CARS today! Rebecca Zung, Esq. and Susan Guthrie, Esq. interview international digital marketing guru, Jeff Bullas. Jeff Bullas has been called a top influencer of Chief Marketing Officers and the world's top social marketing talent. Entrepreneur lists him among 50 online marketing influencers to watch. Inc.com has him on the list of 20 digital marketing experts to follow on Twitter. Oanalytica named him #1 Global Content Marketing Influencer. BizHUMM ranks him as the world's #1 business blogger. But even all of that success couldn't insulate him from the massive punch to the gut he got last year with the sudden death of his beloved partner in life. Her death has caused him to rethink everything about what life really means, and how to have true success and happiness. He is now sharing what he has learned from his own pain and trauma with the world. This is truly one of our most powerful episodes. You can find out more about Jeff Bullas, and read the blog posts that inspired this episode, on his website at www.jeffbullas.com. B.Y.E. DIVORCE RETREATS - as recently announced, REBECCA, SUSAN AND GABRIELLE HARTLEY are partnering to bring you the B.est Y.ou E.ver Divorce Retreats, which will feature inspirational and practical help for women going through divorce as well as those who are still recovering from the process! Many of our podcast guests, including ARIELLE LORRE, JENNIFER GIAMO and TAMMI LEADER FULLER will be featured at the retreats. LAURA WASSER will also be our special guest during our LIVE version of our podcast! The first retreat will be held in Los Angeles this Spring! If you are interested, please email us at breakingfreedivorcepodcast@gmail.com and we will send you all the deets! Hello Divorce is a resource for forms and documents recommended by Breaking Free: A Modern Divorce Podcast. Go here for more!" Rebecca Zung, Esq. and Susan Guthrie, Esq. are tackling one of the biggest issues almost every divorcing person faces at some point during the process. Everyone has a different idea of what is FAIR in divorce, but what can you do about it? Whether it's how the assets and debts are divided, whether you think you should get spousal support or not have to pay it, how much timesharing you think you or your soon-to-be-ex should have, or how expenses for the children should be paid, dealing with the hard issues is always a challenge when you stir in the emotional aspect of the breakup. Rebecca and Susan pull back the curtain on this episode and show you how the process really works and how to determine if what you're getting is actually fair. Be sure to tune in to this one BEFORE you settle! B.Y.E. DIVORCE RETREATS - as recently announced, REBECCA, SUSAN AND GABRIELLE HARTLEY are partnering to bring you the B.est Y.ou E.ver Divorce Retreats, which will feature inspirational and practical help for women going through divorce as well as those who are still recovering from the process! Many of our podcast guests, including ARIELLE LORRE, JENNIFER GIAMO and TAMMI LEADER FULLER will be featured at the retreats. The first retreat will be held in Los Angeles and is coming soon! Email us to be placed on our mailing list so you can be sure get all the updates about this exciting event! Rebecca Zung, Esq. and Susan Guthrie, Esq. interview renowned physician and nutrition expert, Caroline Cederquist, M.D., the creator and founder of Cederquist Medical Wellness Center, and author of the bestselling book, The MD Factor Diet. Dr. Cederquist has dedicated her life and career to helping people through these times and making sure that their nutrition, metabolic function and health remain optimum throughout the tough times. She has appeared on Dr. Phil, The Doctors, The Today Show, Rikki Lake and has been published in thousands of articles. This is a "can't miss" episode for anyone that ever experiences stress (all of us!). B.Y.E. DIVORCE RETREATS - as recently announced, REBECCA, SUSAN AND GABRIELLE HARTLEY are partnering to bring you the B.est Y.ou E.ver Divorce Retreats, which will feature inspirational and practical help for women going through divorce as well as those who are still recovering from the process! Many of our podcast guests, including ARIELLE LORRE, JENNIFER GIAMO and TAMMI LEADER FULLER will be featured at the retreats. The first retreat will be held in Los Angeles on Saturday, April 27, 2019! If you are interested REGISTRATION IS NOW OPEN FOR EARLY BIRD PRICING! Visit our website here for more information. Rebecca Zung, Esq. and Susan Guthrie, Esq. discuss tips and techniques for gaining leverage in your divorce negotiation so you can come to agreement and get what you want. How do you get your spouse to agree to what you want in the divorce? The short answer? LEVERAGE! Negotiation is a skill that not everyone has but Susan and Rebecca have been negotiating settlements for their clients for years as top divorce attorneys and in this episode they share with you their TOP TIPS for gaining leverage so you can get as much of what you want as possible in your divorce. Learn how to use what you know about your spouse's priorities to the best advantage to negotiate a settlement that gives you the opportunity to come to an agreement where you pick and choose what you want and what you can live without. The best way to get past the difficult time of divorce is to come to a settlement and end the process so listen to this episode and start working on your negotiation strategy to gain leverage and incentivize your spouse to settle on your terms today! Rebecca Zung, Esq. and Susan Guthrie, Esq. interview Emmy Award winner, Tammi Leader Fuller, the creator and founder of Campowerment, providing a camp-inspired, expert-driven experience to help you reignite your life! Tammi Leader Fuller is an Emmy-Award winning television news producer and author who, after 34 years with NBC News, The Today Show, CBS News and EXTRA TV, walked away from it all to follow her dream of creating Campowerment. The Campowerment retreats combine the fun and games of the camp we all loved as kids with workshops with some of the top experts sharing some of life's universal lessons. Whether you are going through the dramatic life change of divorce, or other transformation, Tammi has guidance and advice to help you find your path forward and to discover the true purpose of your life! For more information on Tammi and Campowerment please visit her website at www.campowerment.com. The Campowerment three-day retreat featuring our Co-Host, Rebecca Zung will be held in Running Springs, CA on March 22-25, 2019. There are limited spaces available so reserve your spot now! To read Attorney Uswah Khan's blog, including the "Coulda, Woulda Shoulda" article mentioned by Susan in this episode visit her website at www.diaryofadivorcelawyer.com.